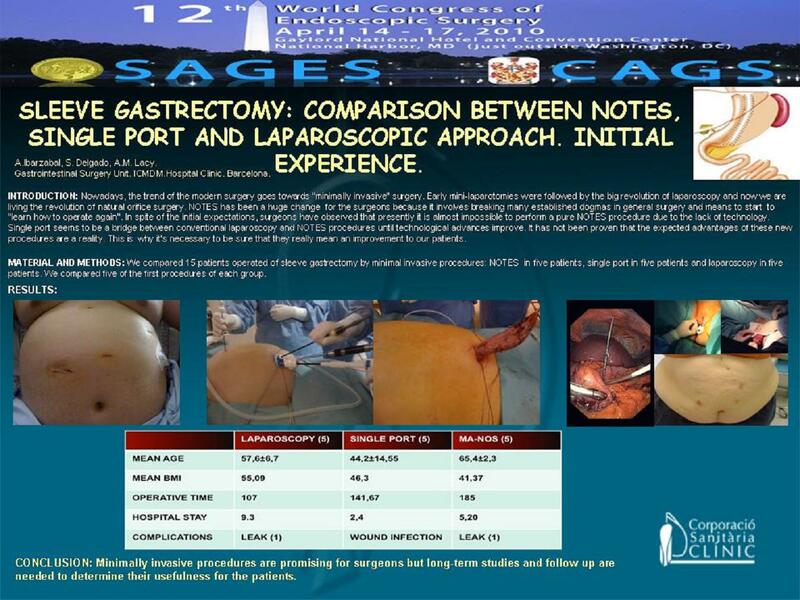 Sleeve Gastrectomy: Comparison Between NOTES, Single Port and Laparoscopic Approach. Initial Experience. INTRODUCTION: Nowadays, the trend of the modern surgery goes towards “minimally invasive” surgery. Early mini-laparotomies were followed by the big revolution of laparoscopy and now we are living the revolution of natural orifice surgery. NOTES has been a huge change for the surgeons because it involves breaking many established dogmas in general surgery and starting to “learn how to operate again”. In spite of the initial expectations, surgeons have observed that presently it is almost impossible to perform a pure NOTES procedure due to the lack of technology. Single port seems to be a bridge between conventional laparoscopy and NOTES procedures until technological advances improve. It has not been proven that the expected advantages of these new procedures are a reality. This is why we need to be sure that they really mean an improvement to our patients. MATERIAL AND METHODS: We compared 15 patients operated of sleeve gastrectomy by minimal invasive procedures: NOTES in five patients, Single port in five patients and laparoscopy in five patients. We compared five of the first procedures of each group. RESULTS:The mean age was 65, 4± 2, 3 for the NOTES group, 44, 20±14, 55 for the single port group and 57, 6±6, 7 for the laparoscopy group. Mean BMI was 41, 37 for the NOTES group, 46, 3 for the single port and 55, 09 for the third group. Mean intraoperative time was longer (185 min) for the NOTES group and mean hospital stay was longer (10 days 3-23) for thelaparoscopy group. We had postoperative complications in the NOTES and laparoscopy groups related with one leakage in every group and a wound infection in the single port group. CONCLUSION: Minimally invasive procedures are promising for surgeons but long-term studies and follow up are needed to determine their usefulness for the patients.